The approach of George Wyllie has been described as‘unseriously serious’ an attitude the artist continues to develop with a freshness, enthusiasm and idealism which marks him out from many of his contemporaries. He came to art in his forties, after half a lifetime in the Royal Navy and as a customs official. Undoubtedly, his aspirations to take art whenever possible beyond the gallery and to encourage the widest possible collaboration is rooted in his sense of difference from the established art world. This equivocalness is reciprocated by an art community in Scotland which, in the main, suspects that the wit and theatricality are at odds with philosophical seriousness. 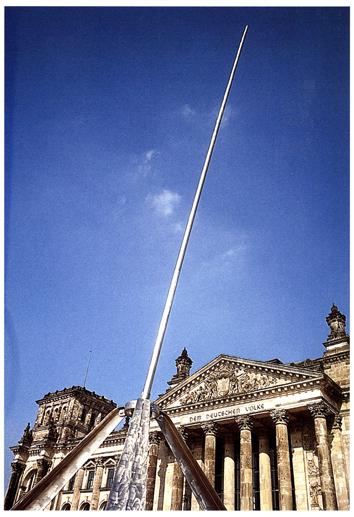 Since the 1970s, Wyllie has made numerous sculptures, such as A Machine for Applauding Paintings (1976), which explicitly mock the self importance of art. Wyllie has entertainingly described the experience of gallery exhibition as ‘like having a bath with your socks on’. Although ocassionly exhibiting in traditional ways, he prefers to make large public sculptures which often become catalysts for performances in schools, theatres and in the remote countryside. The process involves working in the United Kingdom and abroad with ex-shipbuilders, public servants, commercial directors and industrialists, art administrators and helpers of all kinds, galvanised by the good humour and showmanship which very much part of the artist’s style. 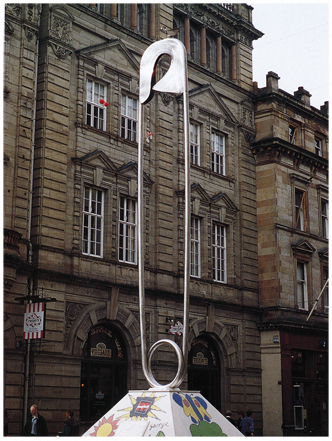 Wyllie’s approach has been highly influenced by Joseph Beuys’s belief in ‘social sculpture’, which in the Germans view meant ‘moulding and shaping the world in which we live’. Beuys’s performance on Rannoch Moor in 1970 was celebrated sixteen years later by the siting of one of Wyllie’s wooden spire sculptures – the only type of work he does which is absent of humour and in keeping with the German artist’s sobriety. The spires are constructed in simple materials, such as sticks and stones, as well as engineered stainless. They are also, in the artist’s words, ‘a sculptural indicator of man-made and natural materials, given free movement by gravity in balance with the air which surrounds it’. As such, they each become an ambitious metaphor for equilibrium on a global scale. Wyllie’s greatest challenge is to maintain the optimism and celebratory of much of what he does while allowing for more philosophical and humanitarian concepts to flourish. For many years now, he has developed the term ‘Scul?ture’ as a questioning alternative to the belief in absolute truths which our post-enlightenment Society still holds to. 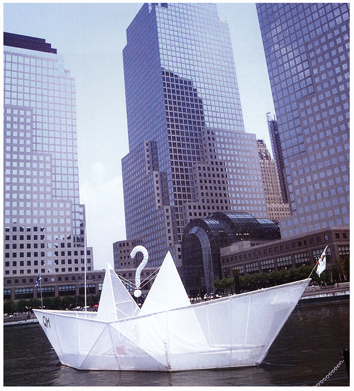 For Wyllie, a question mark lies at the centre of everything. His public sculpture seeks to capture the mood of the times and to make an emblem for the community with whom he works. 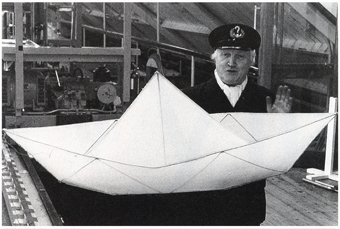 Two examples are The Straw Locomotive (1987) and The Paper Boat (1989), the first of which was a 40 foot long sculpture of a steam engine built from metal and straw. It was suspended above the city of Glasgow from a historic hammerhead crane by the dockside, which once lifted thousands of locally built trains for worldwide export. A matter of weeks later, the artist and many members of the community who were once employed by The North British Locomotive Works ceremonially burned the train on the site of their disused factory. Theundoubted romanticism of the event was a deeply affecting – indeed cathartic – moment and The Straw Locomotive quickly entered the popular psyche of the city. Through this event, Wyllie lamented a lost industry and yet appealed for the creative energy of those who once fuelled Glasgow’s prosperity to be tapped once more.